Published: Jan. 29, 2014 at 09:41 a.m. The Seattle Seahawks and Denver Broncos had a pretty heated rivalry during the 1980s and 1990s. That might be surprising to many of you, but the Seahawks and Broncos were division rivals in the AFC West back then. Many of you might remember the battles of the Raiders and Seahawks, but there are many Seattle fans that can't stand the Broncos to this day. In fact, I ran into one guy who swore up and down to me the Broncos were the most-heated AFC rival of the Hawks. Even our stats guru Bill Sudell agreed with the sentiment as he pointed out one of the best-selling t-shirts in Seattle for years was the "Bronco Buster" top. The reason was John Elway. The quarterback torched the Seahawks like no other. Elway passed for more than 7,000 yards against the Hawks and threw 44 passing touchdowns. The next closest guy is Dan Fouts, who had over 4,000 yards against them. So long-time Seahawks fans will delight in the chance to take down Elway and the Broncos in Super Bowl XLVIII. There have been other statistical oddities in this rivalry, too. The Seahawks and Broncos hooked up in the season finale of 1986. The Broncos had their playoff ticket punched. Seattle needed some help. 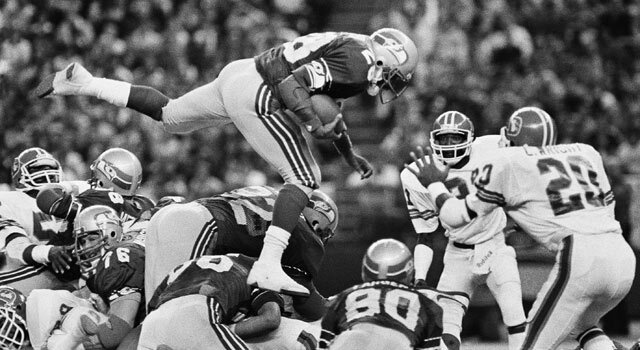 No surprise, the Seahawks won 41-16 as Curt Warner rushed for 192 yards and three touchdowns. But that didn't make the cut on this list because the Broncos didn't have much to play for. Terrell Davis rushed for 208 yards and a touchdown in a 21-16 Broncos win on October 11, 1998. Davis would finish with 2,008 yards that season. So let's get down to the brass tacks here and countdown the six greatest Broncos vs. Seahawks games of all time. The Seahawks landed the controversial Brian Bosworth in the supplemental draft, and Broncos fans were lathered up and ready to pounce as they wore "Ban the Boz T-shirts." The Broncos won 40-17, but the Boz might have had the last laugh. For it was his company that sold those "Ban the Boz" T-shirts for $15 a pop. The Broncos scored 21 fourth-quarter points to rally to defeat the host Seahawks, 38-31. Mike Anderson rushed for 195 yards and two touchdowns and his 80-yard run in the fourth quarter proved to be the winner. The Broncos finished with 538 yards of total offense. The Broncos raced out to a 20-0 lead in the second quarter, and this looked like another runaway for Elway and Co. But the Seahawks would intercept Elway three times and John Friesz would out-duel the Hall of Fame quarterback as he rallied Seattle for a 31-27 win in Denver. The Seahawks scored two touchdowns in the final four minutes, capped by a 20-yard touchdown strike from Friesz to Chris Warren. These were probably the two best teams to go at it in this rivalry. Both teams were 12-3 with the AFC West crown on the line. Elway would throw four interceptions, but the Broncos would go on to beat the host Seahawks 31-14. This was probably the most disappointed the 12th Man has ever been walking out of the Kingdome. The only thing that lingers is neither team did much in the AFC playoffs in 1984. Broncos safety Mike Harden hit the legendary Steve Largent with a cheap shot in the first game in Denver. But Largent got his revenge in the rematch. Harden intercepted Dave Kreig's pass and was absolutely destroyed by Largent on the return. Google it (or if you're lazy, click here). Harden would fumble and Largent even went on to recover it. And to add insult to injury, the Broncos were charged with holding and Seattle kept the the ball. The Seahawks would win 42-14. The Seahawks reached the playoffs for the first time in 1983, under first-year coach Chuck Knox and hosted a wild card game against the Broncos. To say this crowd was cranked is an understatement. The Seahawks would crush the Broncos, 31-7. And no, Elway didn't start this game but he did replace Steve DeBerg. The Seahawks would upset the Dolphins the following week in Miami, but ultimately lost to the rival Raiders in the 1983 AFC Championship Game.